We made it! We arrived safely to the base. Two team’s members are up on the mountain. Life goes on and we’re back to the K2 game. Keep your fingers crossed for the weather! – Adam Bielecki wrote on his twitter on Friday. “We made it! We arrived safely to the base. Two team’s members are up on the mountain. Life goes on and we’re back to the K2 game. Keep your fingers crossed for the weather!” – Adam Bielecki wrote on his twitter on Friday. On the second of February at 9:45 am local time, three members of the rescue team from Nanga Parbat returned to the base: Adam Bielecki, Denis Urubko and Piotr Tomala. 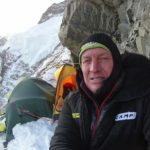 The fourth member Jaroslaw Botor resigned from further participation in the winter expedition to K2, for personal reasons, as stated in the official statement. It’s been over a week since the spectacular rescue operation at Nanga Parbat, in which these four members of the Polish Winter K2 Expedition directly participated. Undoubtedly, it was a time when the attention of the world focused on stories about “an adventure that turned into a drama” (quote from an interview given to AFP by Elisbeth Revol), about reaching the summit and heroically saving human life. Darkness – that’s all you can see on the film recorded by Denis Urubko. But the picture is not needed. These sounds build a scene that the eyes cannot see and heighten the extraordinary impression. Climber’s heavy breathing and words: “Elisabeth” ……… [again a few heavy breaths] …….. nice to see you “, and in a moment louder and more energetically: “Adam, I have her.” Denis Urubko and Adam Bielecki found Elisabeth Revol around 2 am on 28th of January, after they almost ran 1100 meters (3,600 ft) along Kinshofer’s route in record time of about 8 hours from leaving the landing site. It was time that was of the greatest importance in saving the lives of the French, Elisabeth Revol and the Pole, Tomasz Mackiewicz. Unfortunately, terrible weather conditions took a lot of that valuable time. First, they delayed the departure of the rescue team from the K2 base for a few hours. Then, they made it difficult to land at the Diamir base on Nanga Parbat. 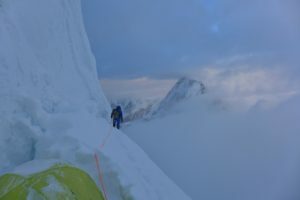 “After arriving around 5pm near the Nanga Parbat massif and finding the base from the air, an attempt was made to land in the first camp at an altitude of about 4,900 m above sea level (16,070 ft) and disembarking the Team and rescue equipment – reports Krzysztof Wielicki, Head of Polish Winter K2 Expedition – “After several unsuccessful attempts, one person was dropped from each helicopter (rescuers were brought by two helicopters – author’s note) with part of the equipment in the main base and after four approaches, after about 20 minutes, necessary equipment and four rescuers were deported in the first camp of Nanga Parbat. Two of the best-acclimatized alpinists, Denis Urubko and Adam Bielecki, set off on the wall by Kinshofer wall around 5:30 pm.” Piotr Tomala and Jaroslaw Botor stayed behind to set a camp I.
Denis and Adam left after sunset, deciding to climb that difficult steep wall during the night, with limited visibility, strong winds and very low temperatures. There was no time to wait for the morning. Only hours were deciding about the life of Elisabeth and Tomek, and additionally weather conditions were expected to deteriorate again. Racing against time, Adam broke his iron rule of not using the old guard rails. “The situation was exceptional, it was about saving life, so we also set this margin of security a bit smaller,” said Adam in an interview with the TVN journalist. While the rescue climbers were running up the mountain, Elisabeth Revol was slowly coming down. “Eli is a brave and strong woman. She also helped herself in that action. 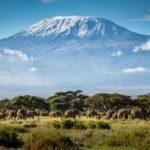 With Denis, we were convinced that we would have to climb for at least 400-500 meters more and that we would probably find her in the morning, “Adam continued. And when he finally saw her … “I was more moved than Eli herself,” he added. At that time, the information about Tomek Mackiewicz’s health condition was crucial. If he was able to move – there was a chance to save him. 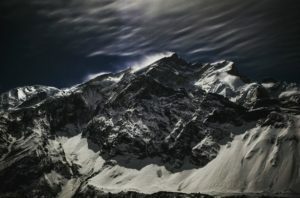 From Elisabeth’s account, it was clear that she had learned about Tomek’s health problems at the summit of Nanga Parbat. It looked like he was suffering from snow blindness. “We didn’t stay at the top even a second. It was just an escape down,” said Elisabeth Revol in an interview with AFP. Unfortunately, her partner’s condition worsened at an alarming rate. Aside from blindness, symptoms of altitude sickness became more and more visible. “At some point, he could not breathe anymore, he took off the cover he had on his mouth and almost immediately began to freeze,” she described Tomek’s health condition. In the camp at 7280 m above sea level (23,880 ft), where she brought Tomek in, it was really bad: swelling, blood coming from his mouth, lack of mobility, lack of contact, disorientation in time and space, severe frostbites. She assessed the chances of her partner’s survival as minimal. “I communicated everyone I could, that Tomek did not have the strength to go down alone. […] I was told: If you go down to six thousand meters, you can be taken from there, and Tomek from the height of 7200 meters (23,615 ft) using a helicopter” – explained Eli. In that situation the only thing left was to bring Elisabeth to the camp, from where she was taken by helicopter to Skardu, and then straight to the hospital in Islamabad. Unfortunately, the rescue team had to wait several days for weather conditions enabling them to fly back to the K2 base. Undoubtedly, the heroes of the rescue operation at Nanga Parbat are Adam Bielecki and Denis Urubko. 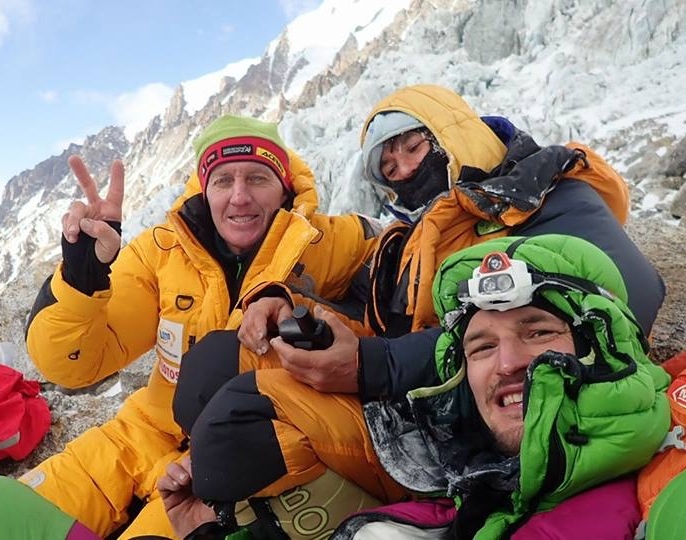 Nevertheless, as Adam pointed out in an interview with Polish TVN, it was a collective effort of many people “starting from diplomatic pressure, support of the Polish Embassy, ​​ the medical coordinator in Poland Robert Szymczak, through the guys from the base on K2 and the expedition leader Krzysztof Wielicki and on the spot, the presence of Jarek Botor and Piotr Tomala in the camp really encouraged us, especially during the few hours we sat under a tarred bivouac (at 6100 m above sea level – 20,000 ft, while resting before taking Elisabeth to camp I – author’s note). Radio communication with the base and the awareness that the guys waited for us, were very important “. Among the people who significantly contributed to the success of this difficult and unusual undertaking were also the pilots of the helicopters. It was thanks to their skills and mastery that they were able to unload the rescuers in a place from which they could set off towards Elisabeth. In the movie “Everest”, there is a scene in which the main character during a climb from the summit, stops on a rock ledge to wait out a snowstorm … and to stay on it forever; a moving picture of the inevitability of the fate of a man who is vulnerable to mountains, heights and nature. The last moments of Tomek’s life were the same? So many questions arise related to this – Was he aware of his situation? Did he feel lonely in those last moments? Did he come to terms with the inevitable? How long did it last while waiting for ….? He kept winning Nanga in a quite unconventional way. As the mountaineer Kinga Baranowska (the himalaist who summited nine eight-thousanders, the first Polish woman who summited Dhaulagiri, Manaslu and Kangchenjunga) described it, “he climbed in a crazy and romantic way”. 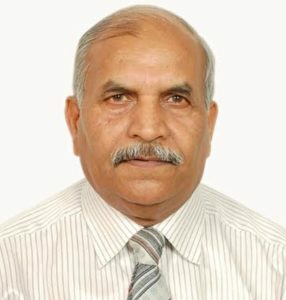 He did not participate in any national programs, he did not have a large budget, he did not use any support, and he did not employ the porters. He was not even informing anyone about his expeditions. “Tomasz was irrational. He was such a torrent of emotions and thoughts; he was carried by dreams. They talk about such people: “free spirit, unhampered man”. Yes, yes, Tomek Mackiewicz was often perceived as a crazy man, or even madman. No, no, no the madman. He just did not like any rules; the rules simply did not apply to him. He was doing as he wanted it to do and that’s it. I respected that, but I would not tie myself to his rope with him.”- said Piotr Pustelnik (Polish alpine, the 20th man to climb all fourteen eight-thousanders) about Mackiewicz.